A participant is seen onstage during the LA Pride Resist March on June 11, 2017, in West Hollywood, Calif. In the ongoing search for solutions to police brutality and state violence, black America has proposed some pretty outlandish ideas, including police accountability, better law enforcement training and—most radical of all—not hiring racist cops. But the recent debate about school safety and gun control has enlightened me to the fact that the previously mentioned ideas are antiquated relics of logic dependent upon the admittedly harebrained idea that buried in the hearts and minds of the average Caucasian is some semblance of humanity and reason. I have fashioned a five-point plan based on the ideas of the president of the United States and the methodology of the National Rifle Association used in the debate about gun control. Because it comes from Donald Trump and the NRA, it is a flawless plan that is both stable and genius. 1. If we want to stop police from killing unarmed black people, we must arm more black people. If arming teachers is a good idea, it only makes sense that arming black people would result in fewer deaths. Bystanders often capture police officers shooting black men and women. What if—instead of cellphones— those people had guns? Using the NRA’s logic, that would make cops and citizens safer, right? Now, some people may counter this argument with pesky facts like the 2015 study of FBI and national crime by the Violence Policy Center (pdf) that concluded that people are more likely to cause an accidental death than prevent a crime when pulling a gun in self-defense. Others will try to unearth the Washington Post report that showed that for every justifiable homicide using a gun, there were 34 criminal homicides, 78 gun suicides and two accidental deaths. The only person who can stop a bad guy with a gun is an untrained, untested, underpaid, overworked person who’s just trying to teach a fifth-period social studies class ... with a gun. Another mistake made by the Movement for Black Lives is the whole protest thing. I don’t know what these folks were thinking. What we need is cash. That’s the beauty of this whole plan! We get sponsors and corporations to do it for us. The majority of the NRA’s money comes from corporations, gun manufacturers and sponsors, not the rank-and-file membership. Maybe we can get some sponsorships from people who benefit from police not killing black people, like SheaMoisture or the prison industry. Perhaps we could even convince Pepsi to repurpose that old Kendall Jenner commercial. I’m pretty sure they’re not using it. 3. Make white kids the face of Black Lives Matter. Maybe I’m the only one who’s noticed that white people don’t seem to respond to angry black people. I haven’t done any research in this area, so it’s just conjecture on my part. Conversely, everyone in America is lauding the effort of the white teen activists who are fighting for gun reform. Perhaps you’ve noticed this before. The gun-reform question was raised after the Sandy Hook Elementary School shooting and after the Las Vegas massacre, and it’s been in serious overdrive since the tragedy in Parkland, Fla.
I’m not trying to call anyone racist, because there’s always the chance that no one’s heard about the gun violence in Chicago or the thousands of black kids in cities across America who are killed by bullets fired from the same kinds of weapons. You know what? I’m not going to cast aspersions by making it seem like white people only care about white lives or white-on-white crime. That would be racist. Instead, I’ll give white people the benefit of the doubt and say that they probably don’t know about Chicago or black-on-black crime. I haven’t done any research in this area, so it’s just conjecture on my part. 4. Make it a mental health issue. Black people, I know this one will be hard to do, but instead of painting cops who disproportionately kill black people as racist or evil, we should address the mental-illness aspect of the equation. Perhaps Jeronimo Yanez, who shot Philando Castile, was a “broken child,” as accused Parkland shooter Nikolas Cruz has been described. How do you know Darren Wilson wasn’t “remorseful” after killing Mike Brown, as Cruz apparently is? As Trump and the NRA says, this is a mental health issue, not a gun issue. Of course, it’s hard for mentally ill people to kill people without guns, but let’s not put too fine a point on this. If only there were a name to describe the mental illness that causes cops to stop, search, ticket and kill black people disproportionately. I’m sure there’s one; I just can’t think of it right now. 5. Invoke the Constitution and bring up the will of the Founding Fathers. This is the longest shot. I’m not a legal scholar, but I’m pretty sure there’s nothing in the Constitution that guarantees black people equal protection under the law. If there were, someone would surely have brought that up by now. The NRA’s entire argument is based on the fact that the right to bear arms is a fundamental right, so the government shouldn’t be able to regulate arms, regardless of how many people are killed by gunfire. 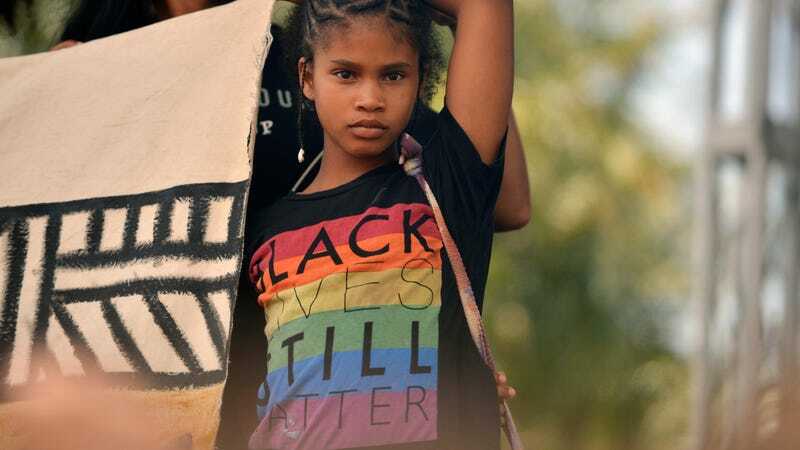 On the other hand, Black Lives Matter is considered a terrorist organization by some people and is closely watched by federal, state and local law enforcement agencies, despite the fact that the organization has been charged with zero deaths. Again, my lack of legal training hampers me from knowing this, but if there were a constitutional amendment that came before the Second Amendment and that guaranteed people the right to peaceably assemble, protest and say whatever they wanted, that would be so dope! But for now, I’d settle for life. By enacting these steps, white people won’t have to suffer the insufferable torture of having to dry their eyes when NFL players demean the freedom and liberty of America by silently kneeling. No longer will they be forced to close their beautiful eyes to avoid seeing another bullet-riddled black corpse. This plan will save their voices from having to reflexively scream, “All lives matter,” when confronted with the prospect that a black life has actual value. I’m doing this for you, white people.